Rice is mankind’s most important grain. It was the domestication of rice many thousands of years ago that turned hunter gatherers into farmers, which then led to houses, communities and the civilisation we now know. Humans eat more rice than any other grain in the world. 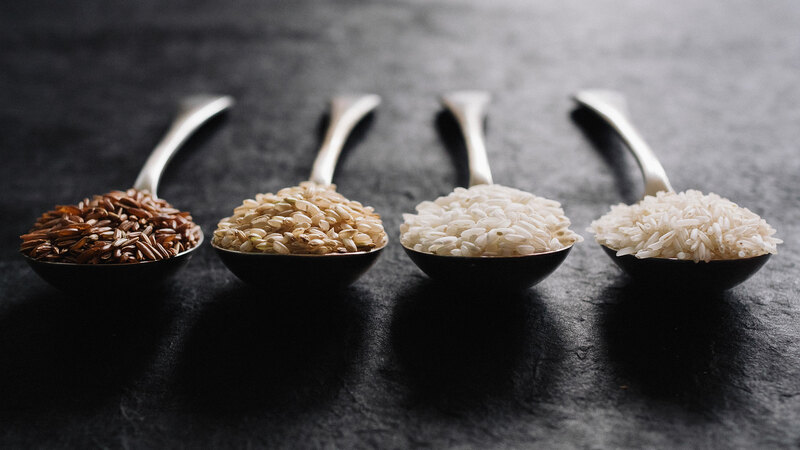 From pilaf to paella, from sushi to jambalaya, rice has proven itself to be a versatile and essential source of nourishment around the globe. 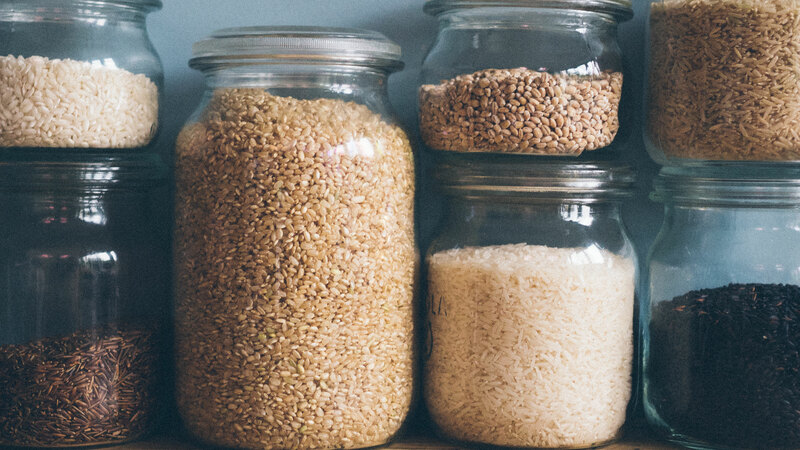 We as a family rely on rice for many of our meals so this month we have been researching the origins, health benefits and environmental impact of this popular grain. Rice originated from Southern China and was first domesticated over 9,000 years ago. It was the Arabs that introduced rice to Europe and the Spanish and Portuguese that took the grains to the Americas. A sister species of rice with a red bran was grown in West Africa at least 1,500 years ago and it was the rice growing expertise of African slaves that helped to boost the production of rice in the United States. There are now over 100,000 distinct varieties of rice worldwide but they all fall into two main categories which are the Indica rices and the Japonica rices. The Indica rices are grown in the sub tropics and they have long and firm grains. The Japonica rices are shorter and stickier like sushi and risotto rices and they are grown both in the tropics and temperate climates. The factor that distinguishes the main rices is the amount of a starch called amylose that they contain. The amylose content is important because it will determine the firmness or stickiness of the cooked rice. 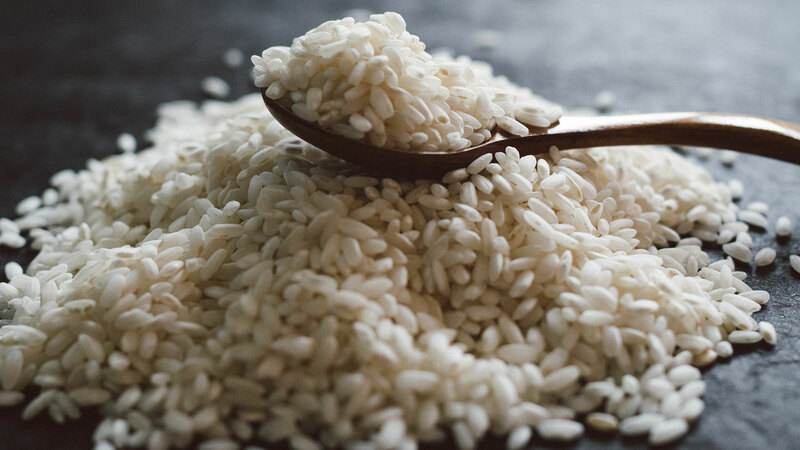 Rice with high amylose content (25-30%) tends to cook firm and dry, whereas rice with intermediate amylose content (20-25%) tends to be softer and stickier and rice with low amylose content (<20%) is generally quite soft and sticky. All rice is primarily a carbohydrate in the form of starches. Brown rice is a wholegrain, it is the unrefined seed that contains all the nutrients needed to grow into a plant. It has fibre, fats, vitamins, minerals and proteins. The starch in the grain is protected by the outer bran layer so it is slowly absorbed by the body and doesn’t have a large impact on blood sugar levels. Like most whole grains, brown rice is good for the heart and lowers cardio-vascular risks. It has a lot of fibre which helps to feed and promote the growth of good bacteria in the lower intestines. But like all whole grains it also contains the enzyme phytic acid, which inhibits the absorption of certain minerals (for more information about this check our post on oats). White rice is far more common than brown rice. It is quicker to cook, easier to chew and lasts longer on the shelf. It is made by refining and ‘polishing’ the wholegrain to remove the bran, most of the germ and the outer layer. This removes pretty much all of the nutritional value leaving almost nothing but starch. White rice is easily absorbed by the body and turned into glucose, this puts it high on the glycemic index and should be avoided by diabetics. Black and purple rice are a wholegrain but have higher amounts of antioxidants, protein and twice the amount of fibre than brown rice. 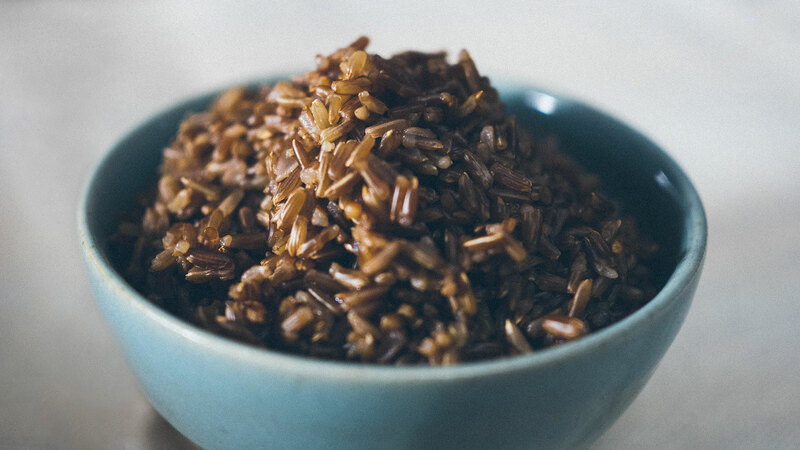 Red rice is rich in antioxidant pigment called anthocyanin and has pretty much the same nutritional benefits as brown rice. So which type of rice? Always choose organic and preferably wholegrain but for certain dishes or when time is tight, choose a good quality white rice. Rice contains more dangerous heavy metals such as mercury and arsenic than any other grain. All plants absorb some amount of these dangerous heavy metals but rice is one of the few plants that actually stores it in the seed rather than the leaves. Furthermore because rice is grown in standing water it has a tendency to absorb more of these elements, particularly if they are heavily covered with pesticides (another reason to always choose organic rice). It’s worth mentioning that these metals are present in all the foods and water we consume and actually the vast majority is found in vegetables, so don’t stop eating rice because of a fear of arsenic poisoning. A good way to remove these unwanted elements is to rinse and soak the rice before cooking. This has the added benefit of removing extra starch, phytic acid and also reducing the cooking time. Although rice is the main grain grown for human consumption, only 7% of what is grown makes it on to the global market. In Asia 90% of the rice is grown and consumed on small family farms and a high proportion of the rice never leaves that farm or it is sold in nearby towns and villages. It’s only when there is surplus that rice is then exported. This means that the local people are mostly immune to international prices and the global price of rice is very much dependant on the weather and the yield of particular regions. West African countries have recently shifted away from their traditional staples of millet and cassava to eating rice and these countries now account for 30% of global rice imports. Rice production takes up approximately 11% of the arable land worldwide and a whopping 50% of all diverted water in Asia is used just to grow rice. In the 60’s the Phillipines began breeding varieties of rice that gave massive yields but were heavily reliant on pesticides and fertilizers. These varieties quickly spread and now most common varieties of rice grown in Asia are reliant on pesticides and fertilizers. All these pesticides are fed directly into the water system. Rice requires 3 times more water to grow than other grains. So as water scarcity becomes more of a global issue we can expect to see a drop in rice production in the future. Rice paddies are one of the largest human sources of the powerful greenhouse gas methane. It is estimated that rice production accounts for 10% of methane pollution globally and recent research has shown that as carbon dioxide levels increase so does the amount of methane that rice produces. However there are ways that these levels can be dramatically reduced through good growing practices such as alternate wetting and drying. It seems there are almost as many different ways to cook rice, as there are types of rice. Each culture seems to have its own way to cook the perfect rice. Here are a few universal truths we have learned over the years of cooking all types of rice in all manner of ways. Cheap, low quality rice will never cook well no matter what your technique. Avoid techniques that require you to discard the cooking water, as you will also be discarding nutrients and flavour. Do not stir long grain rice at all. Once the lid is on, leave it. Since researching for this post we have begun to soak our rice in advance. As well as the health reasons, it halves the cooking time and produces lighter fluffier grains. Note that you will need approximately half the amount of water you would normally use without soaking. Be careful when reheating rice. Raw rice naturally contains the spores of Bacillus Cereus, a bacterium that causes serious (it’s in the name) food poisoning. The spores can survive the cooking process and if the cooked rice is left out at room temperature the bacteria will grow. For this reason it is best to cool cooked rice down as quick as possible if you aren’t going to eat it and store it in the fridge. When you reheat it, make sure that the rice reaches boiling temperatures to be certain to kill off the bacteria. A little pinch of salt goes a long way to increase the flavour of your rice. The first thing to mention is this is as much a guide as a recipe. You can replace the vegetables with whatever you have around, and if you don’t have red rice just use brown rice. The nuts are important as they provide a good source of protein and fats. If you’ve enjoyed this post or you have any questions please leave us a comment here. Great photos as well as an interesting article. A question…How much rice per person? I normally do half a cup…But what’s your suggestion? Trying to make the recipe, which looks awesome! Ithanks would be great to have it typed out…hard to follow along with the video. Ooh yay! Thanks so much. Making it right now for our prep share…my sibs and I prep on Sunday each a dish and share so this will be my contribution, I’ll let you know how it goes!